CorelDraw is the computer application software which is developed for end-users to edit and manipulate digital images as well as producing excellent graphics. This software was developed by Corel Corporation of Ottawa, Canada. This is also called as Corel’s Graphics Suite which consists of CorelDraw with bitmap image editor, Corel Photo Paint and other graphics related soft-wares. CorelDraw architecture is based on vector graphics technology. X7 is the latest version of CorelDraw which is actually CorelDraw 17. CorelDraw X7 is primarily designed for 2D images but it has magnificent applications for 3D environment as well. CorelDraw X7 is the amended version with totally a new look and designing tools for best and effective graphics development. X7 encompasses several new features for graphics, image editing and outline structuring. CorelDraw X7 from Corel platform is a rapidly adopting graphics designing software in the market as compared to its competitors of Photoshop and other editors. CorelDraw X7 is widely using in graphics designing, digital media and creative advertisement and 3D designing. 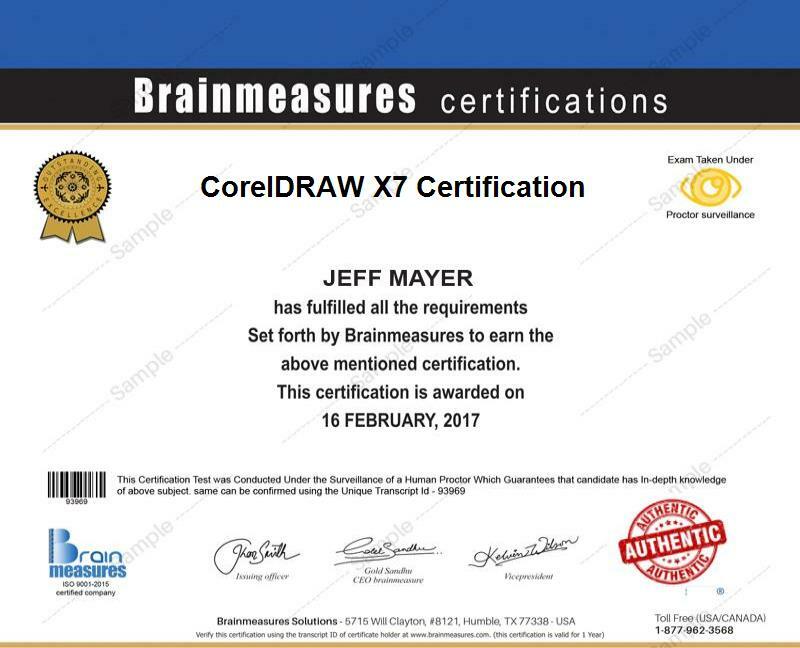 CorelDraw X7 certification from Brainmeasures is the right choice for graphics designers, artists, digital media personnel, news agencies, 2D and 3D designers as well as graphics application developers. CorelDraw X7 through Brainmeasures is totally a different certification from others in a way that permits you to know in relation to best image and graphics development and editing without losing the originality of the digital images and objects especially for vector graphics. Apart from course content and syllabus, the certification program will even let you grip in advanced mastering environment intended for excellent graphics and designs. In order to become a proficient user and excellence in applications of CorelDraw X7, you need to enrol Branimeasures program to attain such expertise which will cause to improve your Resume as well as to raise your income and chances to acquire promotion in your career path. Being a graphical designer, creative advertiser, graphical editor or such alike positions, you will not only acquire knowledge and expertise of using CorelDraw X7 software but this also leads to enjoy financial benefits in terms of salary and income enhancement. The average annual salary for such persons is $87,000 per year which has the multiple potential to increase from that level to $96000- $140000 or even beyond based on creativity in graphics designing and development, level of experience and customer satisfaction. CorelDraw X7 program of Brainmeasures requires some technical knowledge about graphics and 2D/3D designing with publication expertise as well as interest of users in digital media, image editing and graphics designing/development. However, you don’t need to be worried as CorelDraw X7 certification program offered by Brainmeasures aims to help everyone who wishes to increase the level of their understanding about how CorelDraw X7 works. This certification is designed for graphical software engineers, graphical developers, news editors, architectures, civil engineers, 2D/3D designers, creative advertisement developers, banners designers and for all individuals, professionals, advertising or publishing companies and for students who are interested to learn and command over CorelDraw interface especially in CorelDraw X7.